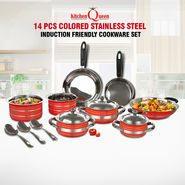 Excellent cookware quality, reasonably priced. Have been using it for a while. This is a good cookware for induction cook stove. Good quality. BUt suits small family. Reasonable price and good service. Thanks Naaptol. Really good products at this price. Can buy utensils online now. I got a good discount also. Very good quality and size. Useful product best gift for housewarming and self-use. Good Colored easy grip full use.